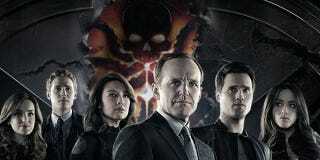 Can the Agents of SHIELD Trust Anyone Ever Again? We Asked the Cast! We talked with Agent Coulson (Clark Gregg), Skye (Chloe Bennet), Melinda May (Ming-Na Wen), Lance Hunter (Nick Blood), Bobbi Morse (Adrianne Palicki), and others to get the scoop on what’s next for Agents of SHIELD after the dramatic end to season two. And Bennett says that she hopes that the Inhumans and SHIELD will work together. Skye always went through being torn between SHIELD and the Inhumans, and she hopes they don’t have to deal with that again any time soon. Meanwhile, Blood and Palicki agree their characters will make nice (Bobbi taking a bullet for Lance will help mend all kind of fences.) And lying isn’t anything new—it’s what their whole relationship has been based on. Ming-Na Wen says her character still believes that Coulson “has great intentions.” Luke Mitchell (Lincoln Campbell) reveals one of his favorite lines from the season finale; and Henry Simmons (Mack) hopes that “Inhumans of integrity” are out there. OH ALSO Gregg and Bennet do the robot dance. Yay!